← An anthropology beyond nature and culture? Tim Ingold and Gisli Palsson’s edited volume, Biosocial Becomings. University of Pennsylvania Press, 2014, 283 pages. Sarah Pinto’s extraordinary ethnography, Daughters of Parvati: Women and Madness in Contemporary India, begins with three epigraphs that have to do with the ethics of writing, representation, and narration. Pinto has much to say about all these things, but the axis on which they revolve is love. In Urdu and Hindi, love and madness are phenomenologically linked as forms of nasha, or intoxication. In South Asia, “mad love”— loving the wrong object, but also, in the sense of love as destructive, cruel, and catastrophic—is everywhere. It is well known that the price of mad, intoxicating love is that (other) things and relations fall apart. These facts of life, Pinto reminds us, are both incredibly “banal and complex” (254). The women we meet in this ethnography—Ammi, Amina, Lata, Kavita, Sanjana, Pinto herself, and many more—are sketched with a depth and vividness that reveals how love, kinship, and gendered vulnerabilities can break a person apart. Through each of their stories, something is also revealed about the limits of both anthropological and psychiatric forms of truth telling and knowledge making. Pinto describes how crazy love, lost love, maternal love, filial love, illicit love, defiant love, and marital love all saturate the practices of Indian psychiatry, medicine, and even ethnography. As she puts it, “the task [of ethnography] is…to observe how the process of reaching for—freedom, care, love, relationships—is filled with actions as things come undone, and how undoing impacts people in different ways” (261). Throughout the book, we see how women in psychiatric care bear the brunt of dissolving kin relations, and how their vulnerabilities as women and as mentally ill persons “ratchets up the effects of the other” (261). This is not, Pinto is careful to point out, a story of how families and institutions collude to produce forms of spectacular abandonment. Rather, as Pinto argues, oppositions between care and abandonment, or freedom and constraint, in many anthropological critiques of neoliberal psychiatry fail to capture the kinds of crises that families and women who are institutionalized in north India face. In chapter 1, “Rehabilitating Ammi,” Pinto writes about the difficulties of understanding everyday acts, such as committing a family member to inpatient care, or bringing a family member ‘home,’ or making a new home for oneself when things come undone, as forms of either care or neglect. Rather, she writes about struggling, “as did the people involved, not only to respond to crises but also to recognize a crisis in the first place, to differentiate what was inevitable from what was unjust [emphasis mine]” (4). This perspective suggests that the anthropology of medicine may need to attend more closely to whether or not enforcing norms, disciplining, and surveilling bodies is really (or always) the focus of medical and psychiatric encounters. The book is divided in two halves, representing the different faces of contemporary Indian psychiatry and the two main institutional sites where Pinto worked. Chapters 2 and 3 take place in the ironically named Moksha, a small, private psychiatric clinic where women reside, mostly involuntarily, in a locked ward, largely in the absence of kin and doctors. Rather than being connected by severity or chronicity, all the women in Moksha, Pinto soon realizes, share experiences of divorce and collapsing marriages. In Chapter 2 Pinto beautifully describes how these limits structure the texture of temporality and care in this space: “a sense of crisis was pervasive,” she writes, “conditioned by a web of muted sensation—stillness, quiet, stoppage of movement” (82). While doctors and social workers relentlessly advise patients to “keep busy” and to “stay alert,” Pinto shows how life in Moksha forces the very opposite to happen, thus creating the very object it is meant to treat. Chapters 4 and 5 signify a major shift in tone and place, since they take us to a psychiatric unit in a large, bustling, government hospital. While both Moksha and Nehru, the government hospital, are the effects of macro-level, ongoing mental health reforms, they could not be more different from each other. Despite the fact that Pinto sometimes goes back and forth between these spaces, even she finds it necessary to keep them apart, splitting her fieldwork time between Moksha (first) and Nehru (second), and maintaining this divide in the book. In contrast to Moksha, in Nehru, women are admitted on a short-term basis and the ward is full of kin who nurse and care for patients. Instead of the stillness of Moksha, Nehru is a fast-paced, hectic, and public ethnographic space. However, as Pinto astutely notes, the effect of kin in the hospital are “two-sided”: “on the one hand, patients were surrounded by kin and cared for by loved ones; on the other, whatever conflicts and stresses were present came into the hospital” (163). As a result, whereas Moksha can sometimes be a breathing space, in Nehru, medicine’s work of stitching frayed relations is done with—and through—kin. The two halves of the book are marked by a gut-wrenching scene at the end of Chapter 3 in which Pinto returns to Boston with her daughter, Eve, exhausted, sick, between homes, bereft. This event only sharpens what Pinto is trying to do in the book, by showing us how her own personal crisis is refracted through the other crises we learn about in the book, and reminds us how we come to know them, too, through her. Her own explosive homecoming is striking for making apparent what is absent in the rest of the book (barring Ammi’s story): the uncertainty of the return home (after institutionalization or fieldwork). Despite the universal pleas of women in Moksha to go home, the dread, fear, and sense of loss that this journey might involve are illuminated through Pinto’s own excruciating voyage. It is through her that we realize there is really no way back. In this moment and many others in the book, Pinto’s life and work threaten to collapse into each other. This was, for me, one of the reasons why this work has such resonance. Pinto demonstrates a rare generosity of spirit in the way she allows her readers to “know” her undoing, and in the process, shows us how knowledge is sometimes a process of unraveling, just as much as it is about collecting and gathering. At the same time, we see how these undoings (always) seem to come, not only with kinship, but also with fieldwork and anthropological relations. There are so many doings and undoings during fieldwork that so many, including myself, have experienced, and yet, no one talks about. That Pinto masterfully controls the leaking of theory and methodology not only serves the book, but it is also a significant contribution to ethnographic writing and feminist anthropology. This book is important, not just for medical and psychiatric anthropology courses, or courses in South Asian studies, but for all graduate students readying themselves for fieldwork. This book is best devoured quickly because reading it is an all-consuming experience. I read it for the first time exactly one year ago, as the haze of the North Carolinian summer slowed everything down around me. I curled up on my couch, underneath a whirring ceiling fan, not so different from the fans in Moksha and Nehru. After letting the cascading effects of this book wash over me, at night, standing on my stoop, I could smell the monsoon. Saiba Varma is an Assistant Professor of Anthropology at UC San Diego. Her research focuses on psychiatric and humanitarian care in Indian-occupied Kashmir. Varma S. Sarah Pinto’s Daughters of Parvati: Women and Madness in Contemporary India. Somatosphere. 2015. 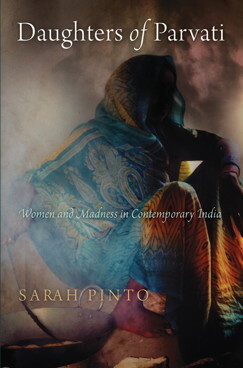 Available at: http://somatosphere.net/2015/sarah-pintos-daughters-of-parvati-women-and-madness-in-contemporary-india.html/. Accessed April 26, 2019. Varma, Saiba. 2015. Sarah Pinto’s Daughters of Parvati: Women and Madness in Contemporary India. Somatosphere. http://somatosphere.net/2015/sarah-pintos-daughters-of-parvati-women-and-madness-in-contemporary-india.html/ (accessed April 26, 2019). Is an ebook available? I wish to get my hands on the book after reading your review.